View of the reconfigured kitchen with informal eating area. 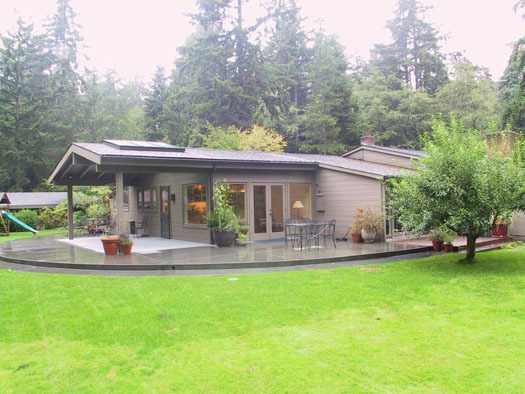 This Highlands residence was custom built about 1950 in a rambling ranch style unusual for that community. It had already been remodeled a couple of times over the years. A kitchen remodel from the 1970s created a big, bland kitchen with a bar, pantry off the hall, and laundry in the hall leading to a non-functional mud room. 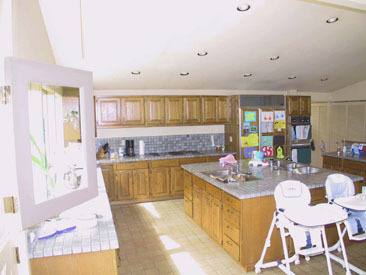 The kitchen space was too large and most of it went unused, while the hall was congested and the dining room too small. It could only seat six in discomfort. 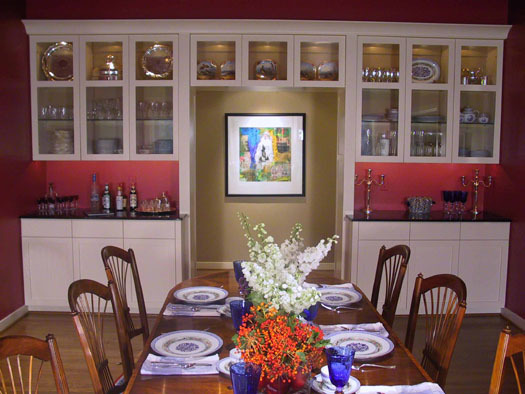 A larger dining room seating up to 10 with a dry bar and built-in storage for dinnerware. 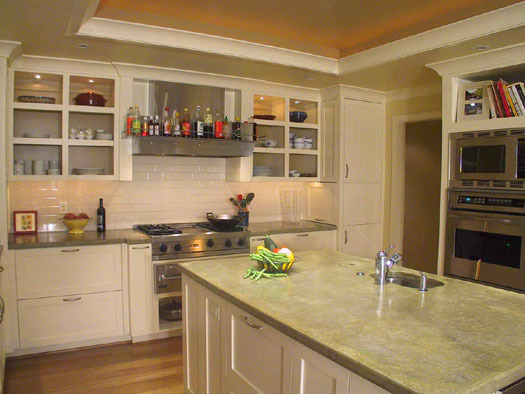 A functional kitchen with a single island, a lower ceiling, and access to the terrace. A true walk-in pantry, a separate laundry that is not part of the hall, and a true mud entry with storage cabinets for everyone in the family. Replacement of a deteriorating covered patio with a new paved terrace and canopy. The kitchen before the remodel: built in the 1970s, it was huge but wasted a lot of space. We gutted the dining, kitchen, and hall areas of the house and removed the terrace and canopy. We created a larger dining room with built-in display and storage cabinets and reconfigured the layout with a new hall that links the dining room, new kitchen, walk-in pantry, laundry room, and new mud entry. The kitchen reflects the owner’s preference for cooking Asian meals, with an island with sink for food prep and a clean-up area by the window overlooking the terrace. 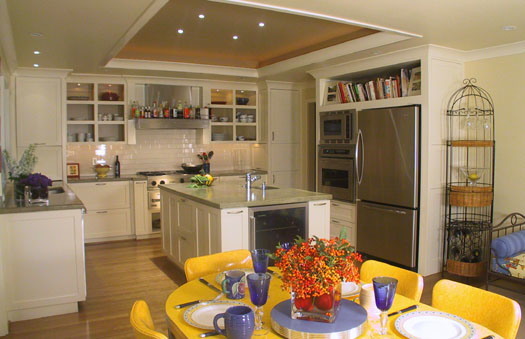 The kitchen ceiling was lowered and coffered for interest and drama over the island. Other elements include an open cabinet style so everything is easy to reach and a custom hood over the Wolfe range to accommodate bottles of sauce. The counter tops are concrete. There is an under-counter refrigerator at the end of the cabinet for drinks, plus a family dining area and couch at the other end of the kitchen. We worked closely with the owner to develop the color scheme. The dining room features back-lit display cabinets fitted precisely with custom-molded countertops of dark-blue fused glass. We picked the blue to work as an accent with the art piece on the wall. 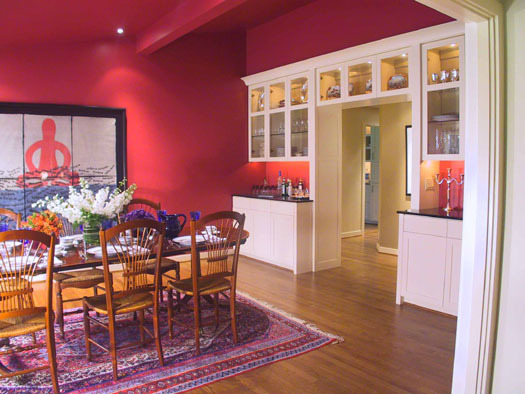 The rest of the dining room color also harmonizes with artwork. The kitchen is subtle with accents of color in the furnishings. The inside of each mud room cabinet has a different color for identification and fun. Consulting with a landscape designer, we created a new concrete terrace partly covered with a skylit canopy that was smaller and more open than the old roof structure and blended in with the terrace and landscaping. A close up of the new prep island. Note the custom range hood with sauce rack. The new dining room, with backlit display cabinets and custom-molded glass countertops. Another angle of the dining room, showing the main piece of artwork around which the color scheme was organized. The new paved terrace with a skylit canopy that replaced a deteriorating patio and roof structure.